Gary, when did you get your car fixed there? I worked there from March 1985 to the Summer of 1987 at Der Wagen Haus. Was it a diesel Rabbit? <grin> It's fantastic what Bob's done with the building. This building just blew up -- a gas leak apparently -- and probably took out the buildings on either side. It was home to the Prescient company. Weeping Radish was great. Used to be a newstand around corner on Main St. Would leave DHS and try to peek at Playboys. Looking northwest at the later intersection of Duke and Main, 1890. 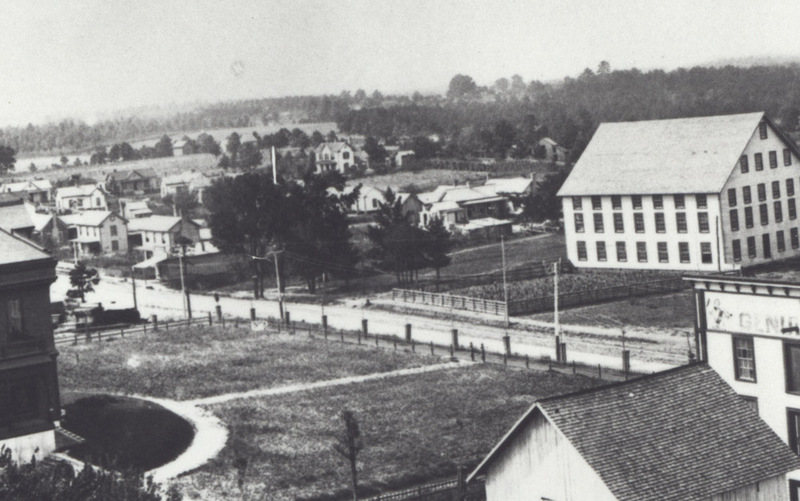 The area around the Duke & Sons tobacco factory still had quite an agrarian feel to it into the 1890s; only the factory itself and Fairview, Washington Duke's mansion at the left edge of the picture, betray something more afoot. In the above picture, Duke St. barely extends north of Main St. (it's on the far side of Fairview). The "Duke" name appears to have arisen from the fact that the street north of Main led (ended) at Brodie Duke's house and large estate one block north. It was Brodie Duke - the least discussed and rather eccentric (and not uncommonly inebriated) Duke brother - who amassed the most significant real estate holdings in Durham or any of the Duke family. The undeveloped area northwest of the intersection of Duke and Main was one of his holdings, and one he donated for the first playground in Durham. Looking west-southwest from Duke Street toward Main. The Main St. Christian Church is in the background. 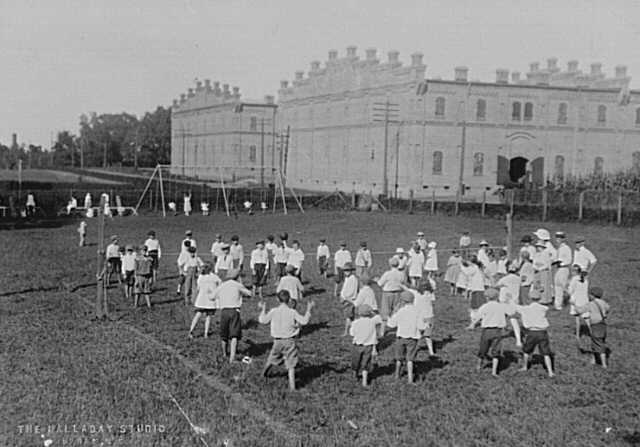 - circa 1910. 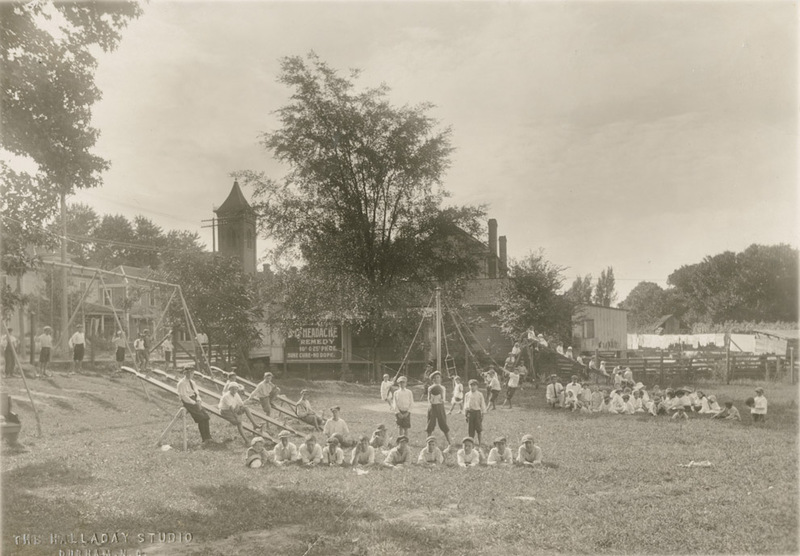 By the 1920s, though, the playground had been developed into a series of buildings, including the Durham Ice Cream Company, Pashcall's Bakery, and a Studebaker dealership. The dealership was built in 1928, and was intially called "Henry's Motor Sales." It didn't last for long, though - it appears to have closed around 1930. It became Brown's Auto Supply on July 1, 1943, described as "wholesale automotive replacement parts jobbers and automotive machine shop services," as seen in this 1948 photo. It remained an auto-related venue into the 1980s; the adjacent car lot (to the south) was filled in with a Dodge service building in the 1950s. Looking northwest from N. Duke, 1981. 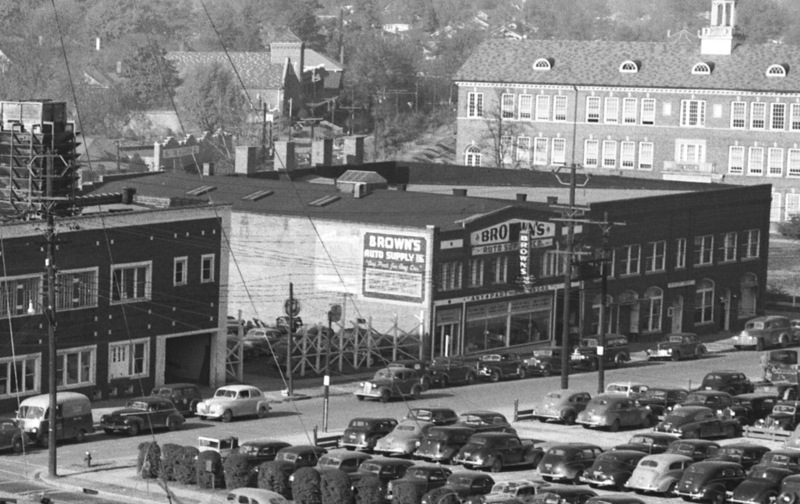 It appears that it also became Lane's Auto Supply at some point, as seen from the below shot of the rear of the building. I don't know if this followed or preceded Brunson's use of the building. In the late 1980s, the Studebaker building became part of a restaurant 'complex' along with the building next door, the former Paschall's Bakery Building. You can read more at that post about the series of failed restaurants to occupy these spaces, but the sequence began with the Weeping Radish, followed by Old Heidelberg Village. Things have gone upscale as of 2007. The Studebaker building has been renovated into office space for Ogilvy, an advertising agency. The utilitarian Dodge Service building next door has become a private garage for an RTP CEO's personal Porsche collection - and I used to get my car fixed in that building. Which was decidedly not a Porsche. 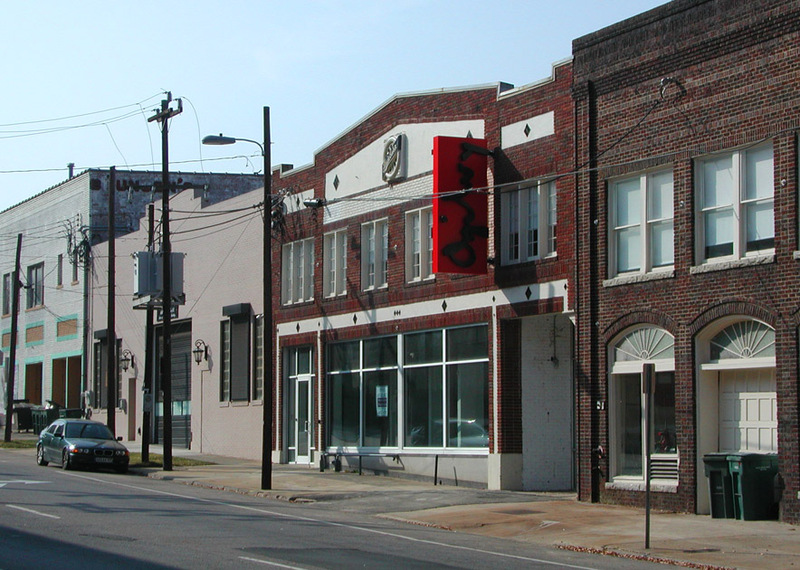 The ground floor storefront on N. Duke St. was upfit as offices for Durham Magazine. After a few years, in 2012, a coffee shop, Respite Cafe, took over the Durham Magazine space. Ogilvy folded at this location and was replaced by ReverbNation in 2013. Two new tenants moved into the building in 2017 - the structural engineering and construction software company Prescient, which relocated their offices from Denver, Colorado and the coffee shop Kaffeinate, which opened in the storefront facing Duke Street, replacing Respite. [UPDATE] Shortly after 10 a.m. on Wednesday, April 10, 2019, an apparent gas explosion occurred at 115 N. Duke after a contractor working nearby had called to report a leak. The powerful blast was felt throughout downtown Durham, blowing out windows in surrounding blocks. The explosion and subsequent fire caused the building to collapse - at least one person was killed and 15 taken to nearby hospitals. It does appear that the coffee shop, normally crowded on weekday mornings, was closed at the time of the explosion. Nearby Durham School of the Arts reported all of its students safe, but did cancel class and send them home. WTVD/ABC-11 has live coverage of the incident as it unfolds - emergency operations are ongoing and authorities are requesting that people avoid the area until further notice. The boom was felt downtown.